You could blame Brooks Robinson and George Brett, but mostly you should blame a slap-hitting, drag-bunting, slick-fielding, former Atlanta Braves farmhand named Terry Muck. Terry played short and sometimes second on the Aurora SealMasters, a men’s fast-pitch team from my hometown that won a bunch of National (and World) Championships when I was a kid. Sounds corny, I suppose, but they were a big deal back then. Their park had a substantial scoreboard, outfield signs, a real pressbox, an announcer, fresh brats on the grill, and even an organist. It wasn’t Wrigley, but it was an easy bike ride from home, and it cost maybe a buck to get in. Anyhow, by day, Terry was an ordained minister with a doctorate and a Fulbright, but to me, under the lights at Stephens-Adamson Field, he was a god—the master of getting on base, moving runners over, forcing bad throws, and making runs happen. He was smart. And quick. And short. Really short. So naturally, from the first time I saw him play, if I had the choice, his #5 was on my back. Crazy how stuff like that sticks with you. The first poster in my dorm room: I Saw the Figure 5 in Gold, 1928, Charles Demuth, American. From Lancaster, PA. Just like my corn. Wandering the stalls at the Manitowish Waters Fleazaar a few years back, I spied a beauty of a Wagner Ware #5 cast-iron skillet. Couldn’t resist snapping it up because, you know, 5’s still my number. I mostly bake smallish pies and fruit crumbles in it (the #5’s an 8-incher, which is pretty perfect for two people plus a little leftover for breakfast), but last night, I tried out a technique for corn pudding I’d seen recently on NY Times Cooking. Don’t you know my #5 Wagner fit exactly five ears? Choose your pan wisely. You want the corn to layer at least an inch thick—any less, and you’re likely to lose too much moisture. You’re aiming for supercreamy porridge or polenta, not cornbread. 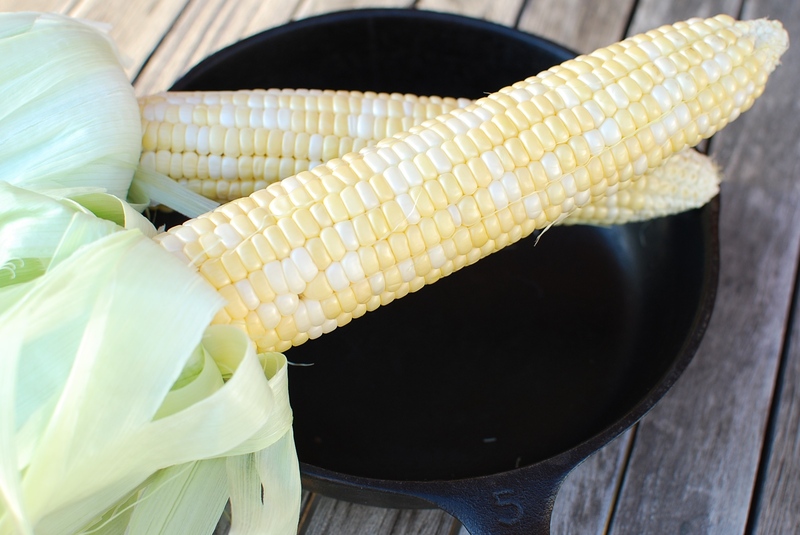 Grate each ear of corn into a medium (8-9″) cast-iron skillet. Fresh corn is juicy corn; this will likely get milky and messy and sticky, so consider working outside or in the sink. I prepped at my picnic table, but still had to change my shirt (and clean my glasses) when I was done. Use the back of a spoon to spread the corn and its juices in an even layer. Bake 20-25 minutes, just until golden and the edges are starting to pull away from the pan. A few crackles across the top are fine; it’s still nice and gooey inside. Spoon the contents of the pan into a bowl. Add a few pats of butter, squeeze in the lime juice, and season with salt and cayenne to taste. Unbelievably creamy and sweet, but it’s simply corn—with a bit of butter, cayenne, salt, and lime. We enjoyed this (two helpings apiece) alongside BLTs. I’ll confess that somewhere between plate and mouth, I lost a slice of my turkey bacon. It was a true Reese’s moment. If I make this again—and I’m pretty sure I will—don’t be surprised if a little crisp bacon gets crumbled on top. Next Post Ketchup for What? Would you mind sharing the type of grater that you use? You can borrow my grater anytime, Dale! Just a regular, ol’ box, using the large-bore side, and I made sure to pull the slider bottom off before I set the box in the pan.